In this passage of Scripture, Jesus promised His disciples that there would come a time where the world would no longer see Him, but since they would be filled with the Holy Spirit, they would see Him. Jesus adds that "Since He lives, they shall also live." Now, in 1 John 4:17, it's says, "...as He is, so are we in this world." Jesus is victorious over all things, and has overcome the world. He is full of peace and love and power and wisdom. And His Spirit lives within us. Poverty, sickness and oppression of any kind can not withstand the power that is in the life of Christ that is alive in every born-again believer. 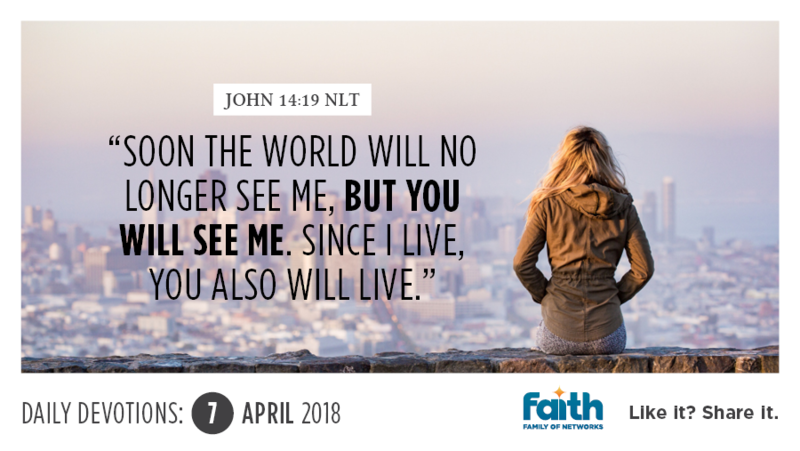 As we renew our thoughts to God's Word and believe what it says about us, we will have the faith to draw from the supernatural life of Christ that is in us. In John 17, Jesus says that He is in us, and the Father is in Him, so that we are perfectly united as one. Do you realise that because of that truth, nothing in this world is impossible, because of God's life in us. Today, declare by faith, "I am in Him and He lives in me. As He is, so am I in this world. In Him, all things are possible and not one promise from His Word will not be fulfilled in my life. Thank you Jesus for Your life in me!"